After the euphoria of that World Series win - one that exemplified all the "Joy of Sox" principles - it's time to enjoy the holiday season with friends and family. While you're at it, don't forget to order our DVD, the ideal stocking-stuffer (also guaranteed to provide more than 8 days of de-light) today. There's still time! 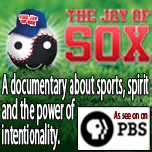 Order The Joy of Sox Movie DVD today! Sports Radio 98.5 FM featured 5 minutes of Rick - Listen to our SoundCloud podcast of Rick jousting with Toucher and Rich. WBUR's health column - Read the CommonHealth post on "Why winning feels so good, so good"